In 2015, a long standing, reputable battery retailer began a branding change. 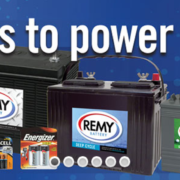 Working with a marketing agency, REMY Battery created a fresh new look to their store front, website, collateral, and mobile fleet. They also wanted to extend this new branding to their battery products. The challenge was they wanted the labels on the battery to match the vertical market that the battery was intended for, but given the competitive nature of the battery industry, they needed to maintain current label costs in order to stay competitive. Solution: Having a relationship with Flexo-Graphics, REMY Battery wanted to roll out the new brand look to their battery front and top labels. Their agency created artwork that was full color graphics designed to be a visual tool to match the battery to the vertical market it was intended for. Flexo-Graphics then used their state of the art digital center to create press runs to combine the skus in the most efficient way possible to save costs and eliminate potential obsolescence. Furthermore, the digital center allowed REMY Battery to roll out brand new full color/ full graphics fronts and tops without traditional plate and set up fees. The labels were still printed on industry tested battery performance label materials, and prepped for future thermal date coding by the retailer. Results: In just 6 days from the moment the art was digitally approved, the 13 new sku’s were printed, diecut and delivered to REMY Battery in time for the traditional fall rush for battery sales. The labels perfectly represented the vertical market with their full color graphics, and matched the newly branded collateral, signage, and vehicles. Print on demand is a business process in which printed material, including product packaging like labels, are printed to order based on the customer’s request. Inventory systems management is a practice companies perform to manage inventory of customer specific stock products. Print on demand jobs and the management of stock inventory may seem to be at cross purposes, but they actually work together to benefit a wide variety of businesses in the following ways. 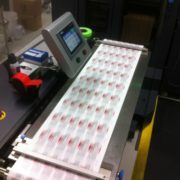 Flexo-Graphics carries a large inventory of customer specific labels and packaging parts in its warehouse. The items are stocked, based on agreements with clients. Typically each product will have a maximum and minimum on-hand quantity to ensure product is available to ship within 24 hours. Clients rely on the inventory systems of Flexo-Graphics for a peace of mind knowing product is stored in a secure and climate controlled warehouse, and is available upon a click of a button. History has shown us that inventory programs meet the needs of a broad array of customers, but generally best fit client’s with product lines that are at a mature market level. Products with a stable demand benefit by having Flexo-Graphics print larger and predictable quantities of the product, then storing in the warehouse for future release. Our online portal allows customers to see real-time data about product levels, and even place stock product orders. Print on Demand meets market need for label on seasonal or short term products. When it comes to the product packaging and labeling, there are quite a few reasons why the same customer who needs utilizes an inventory program may also need a print on demand solution. One of the most common reasons is the need for short run season products, or event based products. Often times products are offered for a limited time, and thus do not require larger volumes of labels printed. Furthermore, marketers are becoming savvier by introducing products in response to an event or action, so time to market to essential and print on demand labels fit the bill. Print on Demand is ideal for beginning or end of life product cycles. 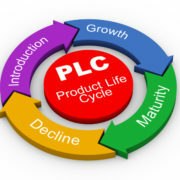 Initially, many organizations are unsure as to the market demand for their products. Print on demand labels are then a perfect fit for products coming to market. Print enough labels for the initial launch, and then migrate the label to a stock item as demand stabilizes. Furthermore, as a product is phased out of the market, companies are using print on demand labels to reduce the potential obsolesce of label as the product retires. Print only what you need; when you need it. Need help with determining your inventory and print on demand solution? Whether you need a stocking program or a print on demand to program, Flexo-Graphics can meet your needs. With a climate controlled warehouse that is internet accessible 24 hours a day, to a state of the art digital center to print labels on demand, Flexo-Graphics is ideally positioned to help. To learn how we can help you with your business-critical operations, please call us today at (262) 790-2740, or use the contact form on our website, to schedule a free consultation. Industry associations are a vital part of the manufacturing community. Associations allow for manufacturers to network, educate, and measure themselves with like manufacturers from around the country. 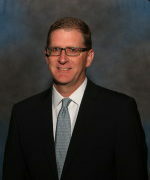 In 2015, Flexo-Graphics President Tim McDonough was elected to the TLMI board of directors. Tim and his brother Mike McDonough bought Flexo-Graphics in 2000. Flexo-Graphics’ roots were in the durable, industrial, and automotive label markets. The McDonoughs worked quickly but efficiently in growing and diversifying the company into new markets. Today Flexo-Graphics is a leader in the prime, automotive, medical, durable, security, and specialty converting markets. Tim leads the operations of the organization. He was instrumental in several major expansions at Flexo-Graphics, including a 35,000’ warehouse facility in 2011, the first North American install of the Nilpeter FB3 in 2013, and the build out of a state of the art digital printing center in 2014. Besides his role in Flexo-Graphics, Tim and his wife have 2 sons and a daughter that light up their life. Tim is a former marathon runner, and a proud Georgetown Hoyas basketball fanatic. His summertime passion is golf, and he can be found on the golf course on Saturdays (after his time in the office), and Sundays after or before taking in his beloved Milwaukee Brewers. Short Run Custom Labels: What Are Your Customization Options? Short run custom labels are short run labels that are tailored to meet the customer’s unique labeling requirements. If you think that you need short run custom labels, you would probably like to know about your options for acquiring labels that are customized just for you. That’s what we focus on in this entry. As you evaluate your short run label needs, keep in mind that short run custom labels can be customized based on the four factors below, among others. To learn about additional factors, contact the label specialists at Flexo-Graphics. Custom labels can be produced in almost any size. Some users require labels that are significantly larger than standard size labels that are typically for the application in question, while other users require labels that are considerably smaller than normal. If you have the chance to reduce the size of your labels without making them less noticeable or hard to read, taking advantage of the opportunity can reduce long-term label supply costs for short run printing. Custom labels are available in a variety of materials, from old-fashioned paper to recently developed synthetic materials. In addition to impacting the efficiency of the printing process, the material of short run labels can impact the general work environment. Short run labels can also be customized in terms of adhesive. Adhesive options include: pressure sensitive adhesive whose bonding strength is determined by the pressure with which the label is applied, temporary adhesive that allows labels to be peeled away easily, permanent adhesive that makes labels exceptionally hard to remove, and adhesive that is designed for low temperature conditions, such as cryogenic storage. Short run labels are also customized with aesthetics in mind. For example, the scale and detail of your company logo may require a specially designed label that makes the logo cohere with other visual elements on the label. Color coding is another important customization option. Color coding labels based on their type of application can make it easier to reference information on the labels. Furthermore, short run labels can be derived from databases to custom many elements of the design: Text, images, and overall color schemes. Need Short Run Custom Labels? If you think that your company is in the market for short run custom labels, contact Flexo-Graphics for a free evaluation of your short run label needs. If you require a custom solution, we can create one that addresses your requirements. We can also supply stock labels that are available for immediate shipment if we determine that one of our readymade products can meet your needs. To get started on the label selection process, please call us today at (262) 790-2740, our use our contact form. We look forward to supplying you with best in class short run label solutions! https://flexo-graphics.com/wp-content/uploads/web-shoot1.jpg 2592 1936 fgadmin /wp-content/uploads/flexologoOLG.jpeg fgadmin2016-02-03 08:41:042017-04-21 16:33:58Short Run Custom Labels: What Are Your Customization Options?